We’re cen­tral­is­ing all dis­cus­sion on the Effec­tive Altru­ism fo­rum. To dis­cuss this post, please com­ment here. There’s been some dis­cus­sion lately about whether we can make es­ti­mates of how likely efforts to miti­gate ex­is­ten­tial risk from AI are to suc­ceed and about what rea­son­able es­ti­mates of that prob­a­bil­ity might be. In a re­cent con­ver­sa­tion be­tween the two of us, Daniel men­tioned that he didn’t have a good way to es­ti­mate the prob­a­bil­ity that join­ing the AI safety re­search com­mu­nity would ac­tu­ally avert ex­is­ten­tial catas­tro­phe. Though it would be hard to be cer­tain about this prob­a­bil­ity, it would be nice to have a prin­ci­pled back-of-the-en­velope method for ap­prox­i­mat­ing it. Owen ac­tu­ally has a rough method based on the one he used in his ar­ti­cle Allo­cat­ing risk miti­ga­tion across time, but he never spel­led it out. I found this model (mod­er­ately) use­ful and turned it into a Guessti­mate model, which you can view here. You can write to me pri­vately and I’ll share my in­puts with you. (So as not to an­chor peo­ple). Have other peo­ple found this model use­ful? Why, or why not? What would be your in­puts into the model? 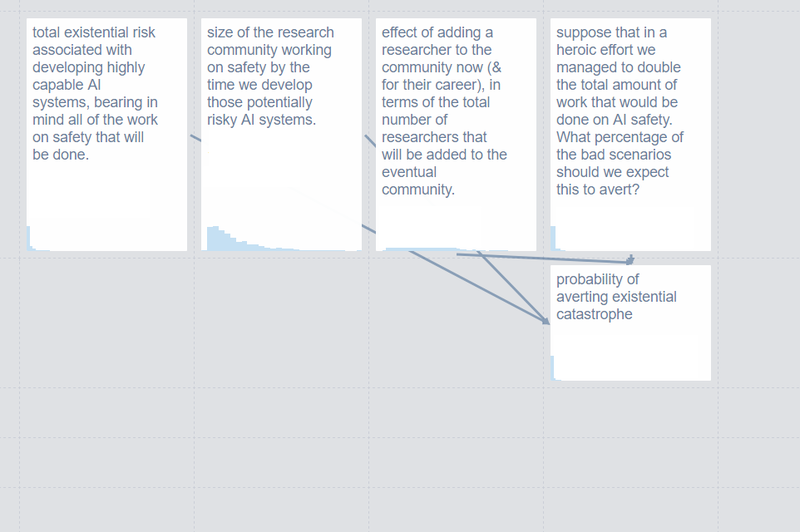 A clear prob­lem with this model is that AFAICT, it as­sumes that (i) the size of the re­search com­mu­nity work­ing on safety when AI is de­vel­oped is in­de­pen­dent of (ii) the the de­gree to which adding a re­searcher now will change the to­tal num­ber of re­searchers. Both (i) and (ii) can vary by or­ders of mag­ni­tude, at least on my model, but are very cor­re­lated, be­cause they de­pend on timelines. This means I get an oddly high chance of avert­ing ex­is­ten­tial risk. If the ques­tions where com­bined to­gether into “what frac­tion of the AI com­mu­nity will the com­mu­nity by en­larged by adding an ex­tra per­son” then I think my chance of avert­ing ex­is­ten­tial risk would come out much lower. Yes, I think this is a sig­nifi­cant con­cern with this ver­sion of the model (some­what less so with the origi­nal cruder ver­sion us­ing some­thing like me­di­ans, but that ver­sion also fails to pick up on le­gi­t­i­mate effects of “what if these vari­ables are all in the tails”). Com­bin­ing the vari­ables as you sug­gest is the eas­iest way to patch it. More com­plex would be to add in ex­plicit time-de­pen­dency.